Jim Paredes will launch his album on Friday, June 17, 6 p.m. at Eastwood Mall Open Park and on Saturday, June 18, 7 p.m. at Venice Piazza, McKinley Hill, Fort Bonifacio. His music kept us humming for generations. After decades of being with the renowned group APO Hiking Society as its main composer, Jim Paredes is going solo. The product of his first undertaking is Laro, released under MCA Music. You can finally catch him perform his own songs live as he launches his album on Friday, June 17, 6 p.m. at Eastwood Mall Open Park and on Saturday, June 18, 7 p.m. at Venice Piazza at McKinley Hill, Fort Bonifacio. Hear songs he wrote himself, like the carrier single "Butong Pakwan" and other tracks like "OPM Rap," "Ang Ganda Mo," "May Araw Ka Rin," "Sinungaling," "Feeling Guilty," "Libog Lang Yan," "Lumisan Na Siya," "In My Heart," "Basic Love," "Sumpa," "Live Your Own Life," "Mangarap at Managinip" and "Palagi-lagi." Learn from the legend as he shares with one of the country’s premiere guitarists Francis Reyes on how he crafted these songs. MCA’s newest music gem, Tricia Garcia, will also appear as guest. 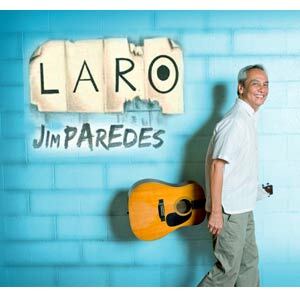 Those who will buy a copy of Jim Paredes’ album Laro at the venue can have it signed by Jim himself after the show. "I am excited, thrilled, proud and giddy about the product of my latest passion," Jim said of his album. Jim Paredes being a prolific composer, music lovers can expect an album with different themes. "Some of the new songs date back to the ’80s when I made them and had put away in a baul in my head. I never presented some of them to APO or anyone else because I felt they were not ready to be heard. "Some songs were written for APO but never saw the light of day," Jim said. "My purpose with this album is to bring forth into the world my creative offspring. Like real kids, some are modern and hip, some are old-fashioned, some like to experiment, some are moody and some are the cuddly types who enjoy making me feel good and mushy." Laro is now out in CDs under MCA Music.